The title of this post may confuse some so allow me to clarify. What I meant by 'First Time for the Third Time' is that even though I have visited this desert city twice before, my third visit might as well have been my first because Dubai keeps changing...it gets bigger, better, taller, newer, higher and glossier. 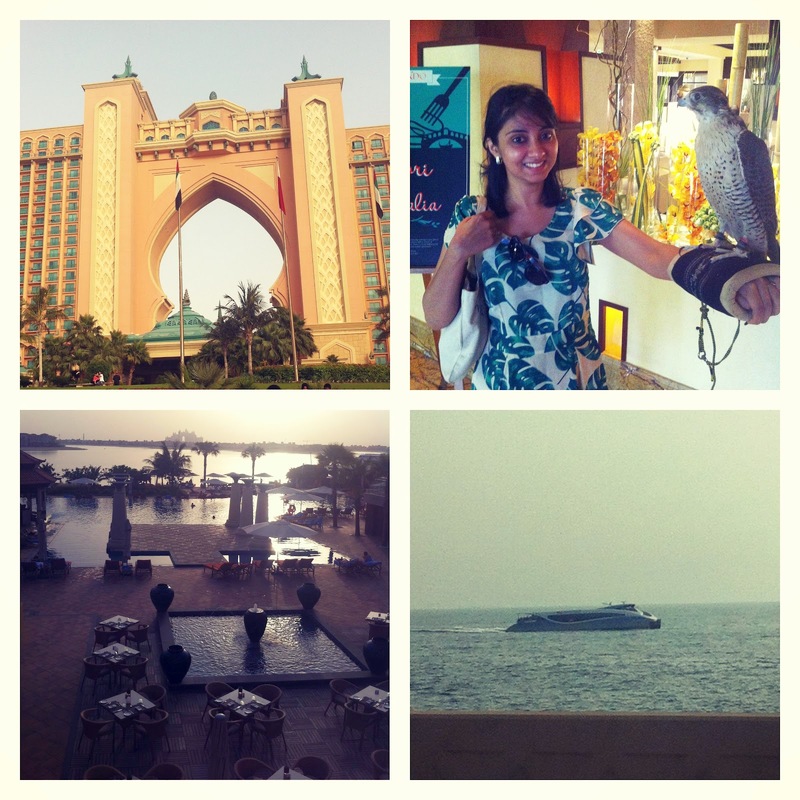 I did not plan to visit Dubai, the trip - you can say, just happened! I en-cashed some frequent flier miles on Emirates and used up my IndiGo Airlines discount voucher (yay to Twitter contests!) and thus ended up saving up a lot on my airfare. But a week before I was due to fly, I got the viral flu and was regretting my decision to travel. I wondered if it was worth the effort - my wanderlust cravings always overpowered my need to just stay put and rest during my off time. Touchdown in Dubai, and I felt well again, yes, just like that. Call it adrenaline rush if you like! I was so excited to be on international shores with friends and food and fun to look forward to! 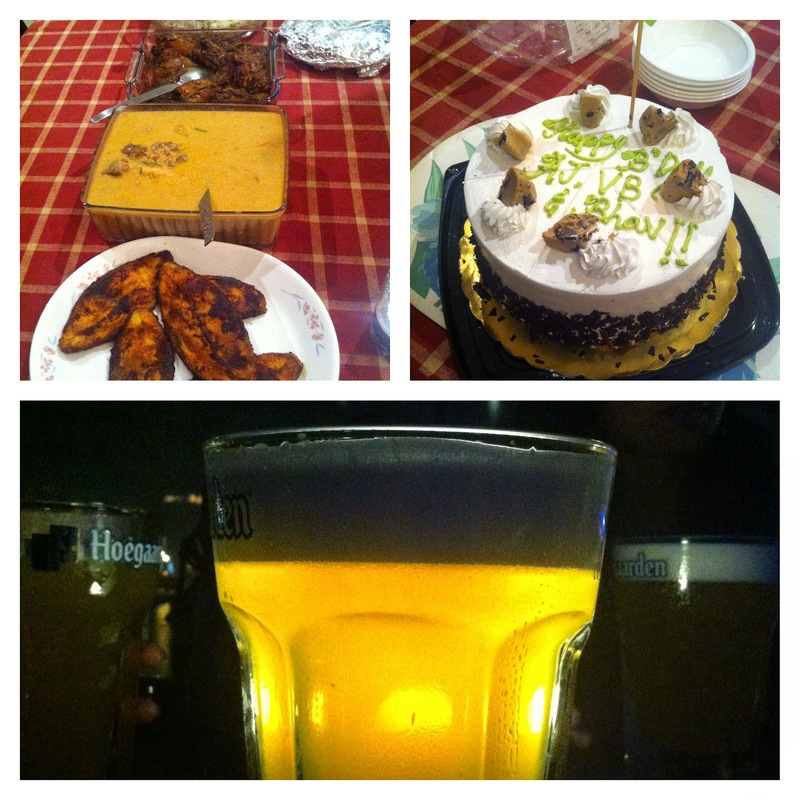 The evening I landed, we headed straight for a friend's place for a home-cooked meal of subtly-flavoured mutton stew and steamed rice, followed by a Coldstone ice-cream cake. It's a pity that we barely had a bite of it because we were so stuffed; but that one bite was my very first Coldstone experience and it was heavenly! We then left for The Belgian Cafe at the Crowne Plaza. Seated in the al fresco area near an artificial water body, the night progressed us friends did some catching up over beer and well, more beer. Our next day began well into the afternoon after a much needed night's sleep. We had lunch at Wafi Gourmet where our table was laid with grilled chicken and lamb kebabs, hummus, tabouleh, pita stuffed with lamb mince and cheese, and a platter of assorted baklava and Arabic ice-cream to end things on a sweet note. The ice-cream was its characteristic chewy and almost stringy like cheese, quite a fun thing to eat actually. 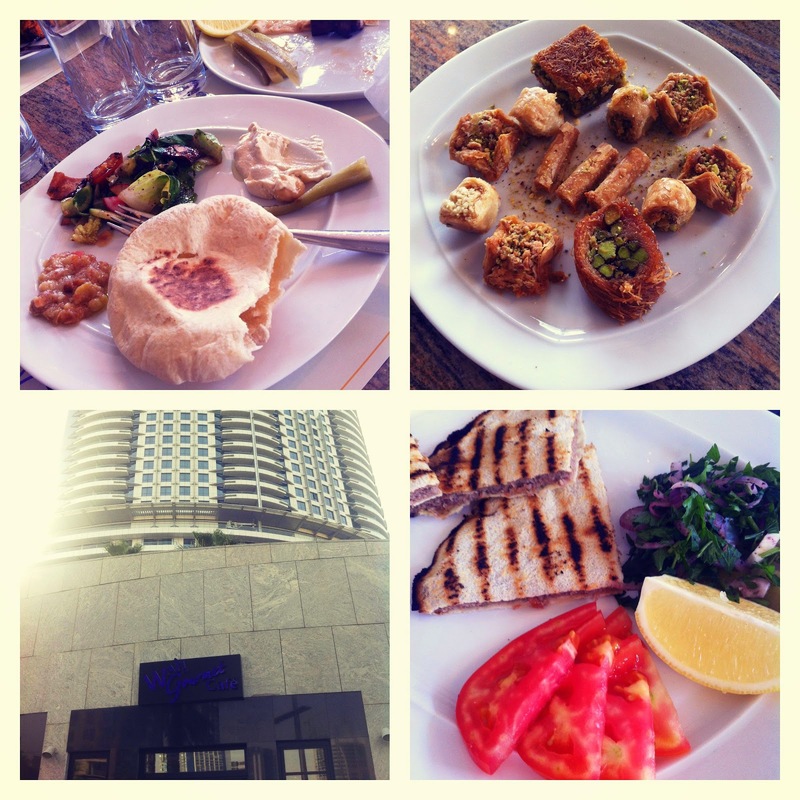 Sated with all that Lebanese food, we then left for a drive around the city. One of our first stops after a while of car window-sightseeing, was The Palms and in particular, The Atlantis Hotel. There was an underwater tunnel that we drove through to get to the outer semi-circle of the Palm to arrive the Atlantis. While in the tunnel, we turned on the GPS and the location pin showed us moving through water, which was quite an amusing thing to see! We stopped by for a bit at a promenade by the water and saw in the distance a round futuristic looking spaceship floating by - the water taxi it was, my friends shared. Thirsty, we then left for Anantara Hotel and Resort and it instantly felt like I changed continents and was in Thailand! In the lobby, I had my first experience of supporting Dubai's national bird, the falcon on my wrist. Yes, I know I'm such a typical tourist... Almost for two hours we sat at Anantara, with the view of the beach, the sunset and the silhouette of the palace-like Atlantis in the distance. Insert #lesigh! Time flies when you're having fun... the night approached. On our drive back to the city, we spotted a police car and not just any police car, but a Porsche! We were told, they are usually not easy to spot on the roads. 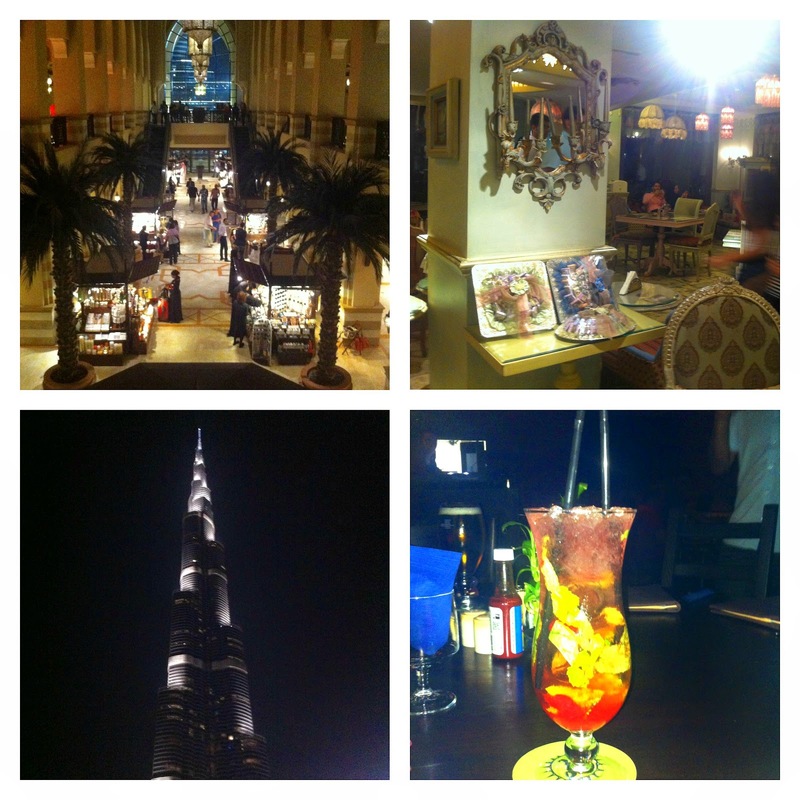 We left for Souk Al Bahar for dinner. 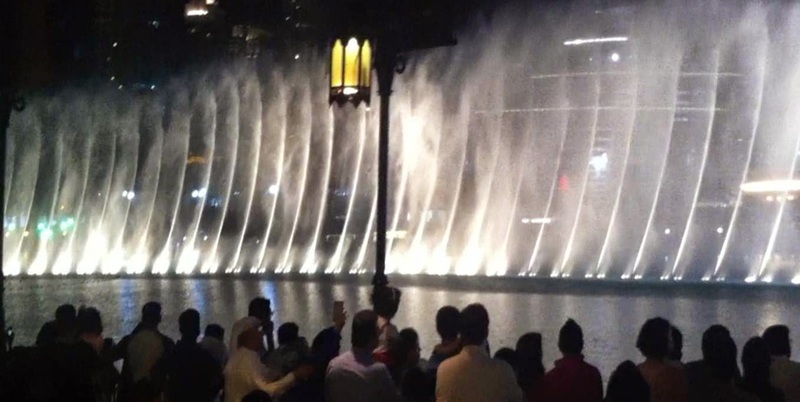 Before heading to a restaurant, we wanted to experience The Dubai Fountain. With the tallest building in the world Burj Khalifa glittering in the background and water dancing to some really soothing Oriental music, I struggled to contain myself from getting goosebumps on my hand...it was such a surreal experience! How can you visit Dubai and not do sheesha! We went to this strange place called Shakespeare Cafe. The back-in-the-era interiors were an eye sore, especially if you are a guy. Picture this: pink and green floral wallpapers with coloured cane chairs and clothed chandeliers. After the mint and cherry sheesha, we went to Cafe Habana for some Latino fare. I was told the chicken wings were the best here and I can attest to that - those spicy, hot chicken wings were the best I have ever eaten; I must have finished an entire plate all by myself! After dancing to the resident DJ's Mexican beats, how can you blame me... Here I even drank my first ever Mosquito! Confused? It was the name of my Mexican mocktail and I chose it from the menu only so I could say "I'm drinking a Mosquito". My next day began with spicy memories of the chicken wings. But my agenda involved eating Magnolia's cupcakes at The Dubai Mall (but of course, the largest in the world). Our blessed friend took charge of walking us through the mall and taking us to sample some of the best food there. Our first stop was Pappa Roti. Having heard so, so, so much about it, I had to try it. It was a bun served hot - crispy on the outside and soft buttery flavoured on the inside. With toppings like honey, cinnamon, nuts on the menu, we went with a regular chocolate sauce. I would say it was overrated and the service was pitiable. We then dashed to Hummingbird Bakery where we chose to share a Belgian Chocolate Cupcake. With the perfect frosting to cake ratio, the intense chocolate flavour and the soft cake texture, this was the best cupcake ever. The kind lady there even cut out a slice of the Rainbow Cake so I could take a look at its colorful layers. This was stuff Pinterest was made of! Time for cupcake number two at the famous Magnolia Bakery tucked at the entrance of the Bloomingdale's store. Watching the pastry chefs layer cake on cake and smothering colourful frosting in between was a treat for the senses. We chose to sample their Red Velvet Cupcake with cream cheese frosting. It tasted like - and I steal a line said by a friend - "clouds in my mouth". It was time to spice things up and we were taken to a very busy P.F.Chang's. Every table was ordering their signature Dynamite Shrimps, and so did we. Pardon me for saying this, but it was here I had my best shrimp dish EVER. You have to eat it to believe me! Served in a cocktail glass, the shrimps were coated in fried tempura batter tossed in spicy shriracha aioli. We also ordered Chang's Chicken Lettuce Wraps - wok-tossed shredded chicken mix eaten with cool cups of juicy lettuce. 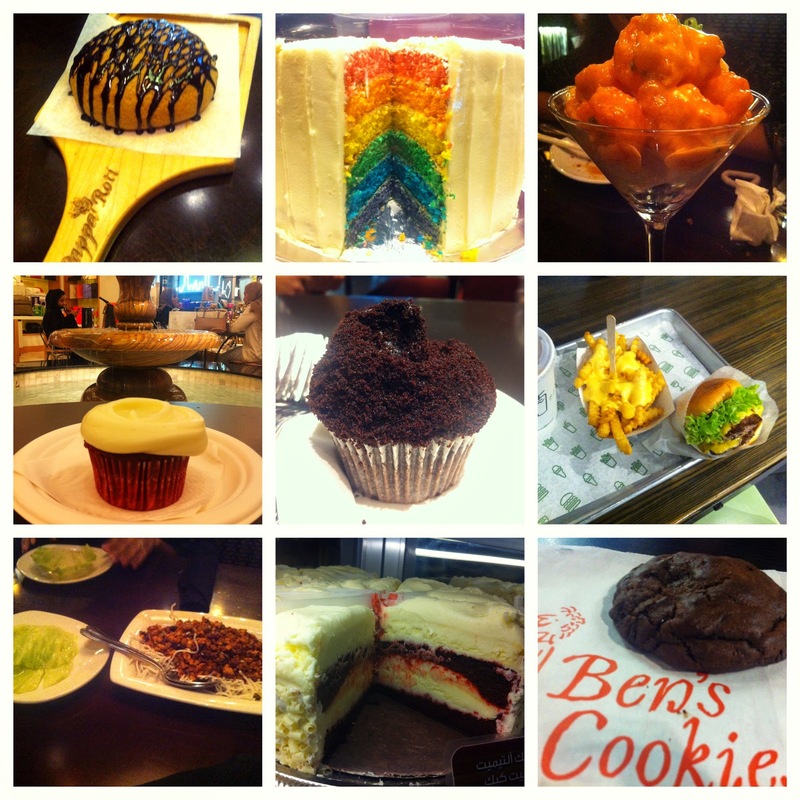 We were back to craving for something sweet and grabbed the Original Cheesecake from the intensely crowded The Cheesecake Factory and Double Dark Chocolate Cookie from UK's popular Ben's Cookies's humble kiosk. Both were just perfect sweet endings to our food trail around the mall. 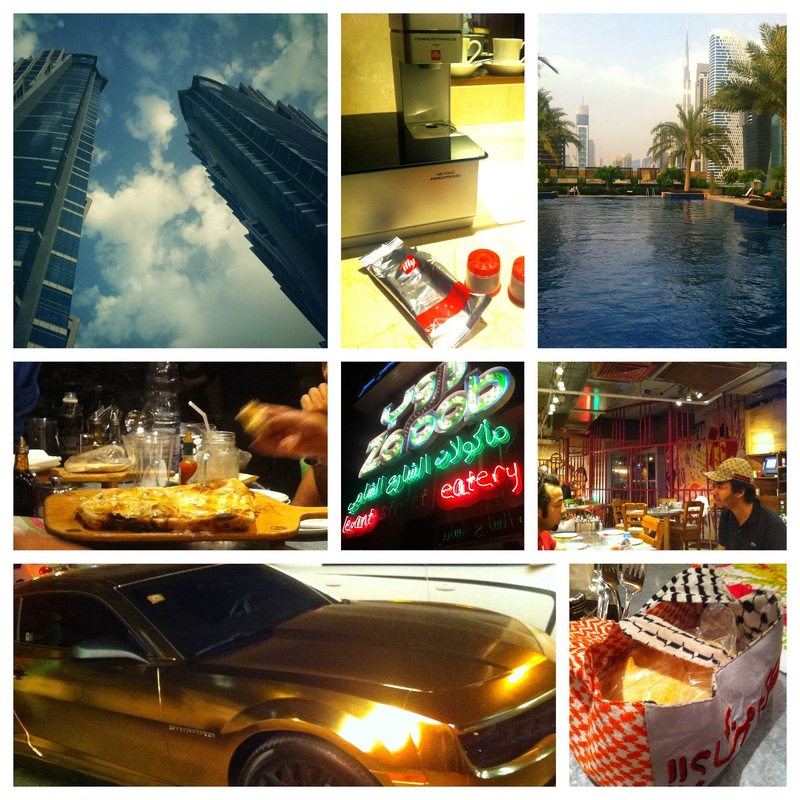 We then checked into the tallest hotel in the world with twin towers - J.W.Marriott Marquis. After struggling to operate the fancy shiny espresso machine, I gave up and chose to go for a swim. There I met an Iraqi man who shared tales from his war-torn land but shared that I could easily earn up to $2000 per month if I went there to work. No, thank you sir. But that's another story for another blog! It was my last night in Dubai and after a friend's birthday revelry at Rodeo, we headed to Zaroob, a restaurant with a funky fit-out known for its authentic Lebanese food. Heaven, heaven, and more food heaven! Hummus, pita and a never-before-eaten Fateer - it's like naan doused with Kraft cheese spread and honey...think clouds in mouth again. This is a must have! The next morning, I left for the airport after having tasted so many 'best evers' and having visited 'the tallest', the and 'the biggest' in the world. It was just a two and a half day trip which felt like a dream. Before I knew it, I was back on my desk checking mails in office when this article took my attention and made me think of all the grime behind the glitter in Dubai - read The Dark Side of Dubai.